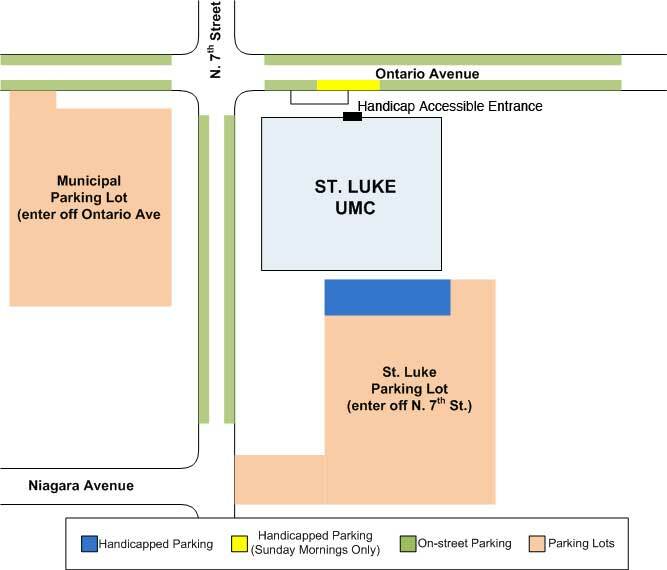 The St. Luke parking lot is located south of the church with entry off of North 7th Street. The lot usually has open spot during the week but fills up quickly on Sunday mornings. There is a municipal lot at across the street (southwest corner of the intersection of North 7th Street and Ontario Avenue). This lot is free and has open spots on Sundays. On-street parking is available on North 7th Street and Ontario Avenue. Spots are metered but the meters are not used on weekends. There are six handicapped spots in the church lot and two spots north of the church on Ontario Avenue that are reserved for handicapped use on Sunday mornings. Entry doors near both areas are handicap accessible. How do I become a member of St. Luke UMC? Please click here for more information on membership. How can I donate flowers for a Sunday service? Click here for more information about donating flowers. May I pick the week my memorial will appear in the bulletin? Yes, you may. Please be sure to have the information that you’d like to appear in the bulletin delivered to the church office a week before the Sunday that you’re donating flowers. Is my flower donation tax deductible? Yes. Your flower donations appear as a separate line item on your giving statement. May I take my flowers home following the service? Yes. The flowers you donate are yours to take home following the Sunday services. What are some reasons people choose for flower memorials? In celebration of a special spiritual event, such as baptism, confirmation, wedding, etc. To honor an achievement or milestone, birthday, graduation, birth, anniversary, etc.